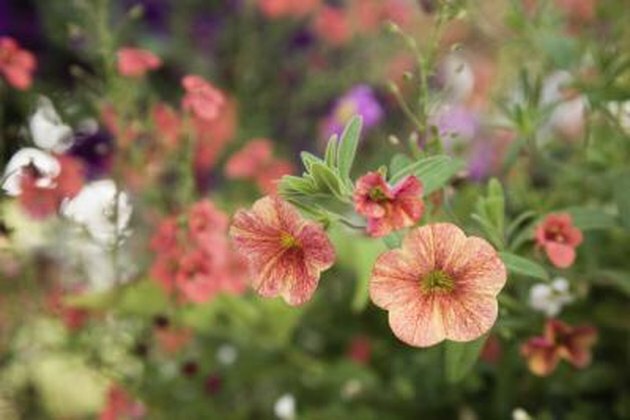 The petunia -- with its long blooming period and low maintenance requirements -- remains one of the most popular flowering plants among gardeners, according to Clemson University Cooperative Extension. The plant grows 6 to 18 inches in height and spreads up to 4 feet, making it ideal for borders, containers and mass plantings. Petunias come in many colors. Petunias are annual flowers that bloom from spring until frost in the fall. Flowers reach up to 4 inches in diameter, depending on the cultivar, with the 'Grandiflora' variety producing the largest blooms. All petunias, but especially white and purple ones, produce a pleasant fragrance. Although petunias are annuals, providing the best possible growing conditions allows petunias to produce more flowers for a longer period of time. Choose short and compact plants at the nursery, preferably ones without flowers, for best results when transplanting. Place petunias in full sun to avoid spindly plants with few flowers. Water deeply on a weekly basis and apply balanced fertilizer monthly to encourage root development and support fast growth and abundant flower production. Removing old blooms allows petunias to put energy into new flower production rather than increased size and foliage development. This also improves the appearance of the plant.